The Spirit of Arachyr Set Dungeon is located in Act II, Dahlgur Oasis. This is one of the harder Set Dungeons to find, so take the waypoint to that location and start backtracking towards the entry point (the Manajuma set plus Angry Chicken form will help immensely with this). Once you reach the beginning of the zone, Path to the Oasis, turn around and start following the left wall of the Dahlgur Oasis. In the second larger clearing, near a small pond, the portal to the Arachyr Set Dungeon will appear if you have the 6-piece bonus active. The Spirit of Arachyr's two unique Primary Objectives are to: 1) Lick 30 enemies with Hex Toad of Hugeness; and 2) Kill every elite while it is webbed by Spider Queen and being bitten by Piranhas. 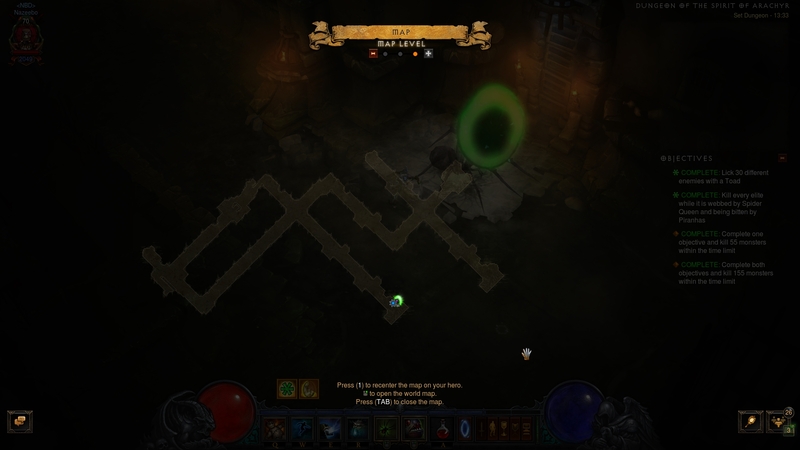 The Spirit of Arachyr Set Dungeon is a very short sewer tileset that connects two corridors, roughly q- and t-shaped, respectively. A proven attempt path is to clear the left corridor first, since it naturally loops and leads into the one on the right. Bone Warriors and Accursed — while the former are slow and the latter are fast, one thing remains a fact for both trash types: they will be the catalyst to the completion of the 1st Objective. Servant of Arachyr — the unique enemies of the map. They resemble Act III's Herald of Pestilence trash, but also has the Thunderstorm affix. While they have decent damage potential, their susceptibility to crowd control and the Objectives of this Set Dungeon should mean they never get to hit you. Try to get the "toad licking" Objective done as soon as possible, since the enemies in this Set Dungeon are not as abundant as in others, and are farily low health — meaning, any properly geared Arachyr WD will likely oneshot them. In order to bring out the Toad of Hugeness (given to you for free by the 4-piece bonus), you will want to cast your Hex Angry Chicken near an enemy pack and then run out, detonating it outside the range of enemies. This way, you will both avoid oneshotting the trash and you will give the toad time to do the licking. Note that the Spider Queen that accompanies you due to the 2-piece bonus is also fairly powerful and can kill off trash before the toad — but is thankfully under the control of your Corpse Spiders. Simply drag her away from the trash by detonating at a safe distance and spamming Corpse Spiders near yourself. Once you get the first Objective out of the way, you can start cleaning up with all the firepower at your disposal. Keep in mind however, that you need to kill all 5 elites on the map with a combo of Corpse Spiders and Piranhas. When you spot an elite on the horizon, simply pre-detonate your Angry Chicken form, toss a Corpse Spiders jar on top of the elite from a distance and immediately CC them in place with a Piranhas Piranhado. A sufficiently powerful Arachyr WD will have no problem oneshotting the elite in one combo.